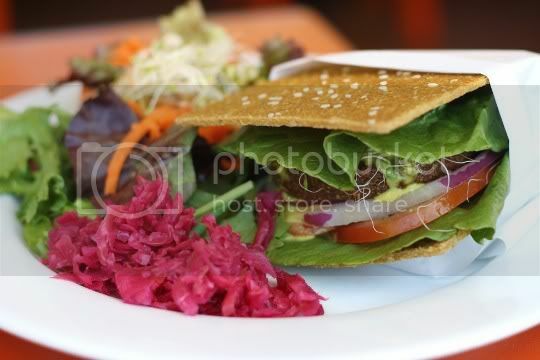 A vegan restaurant that serves raw AND cooked food, while doubling as a snazzy juice bar? And in my neck of the woods? Score! As many of my fellow Westsiders would agree, it's surprisingly difficult to find popular vegan eateries that aren't above the 101 (hello, hipsterville). So Leaf Organics is a dream come true! 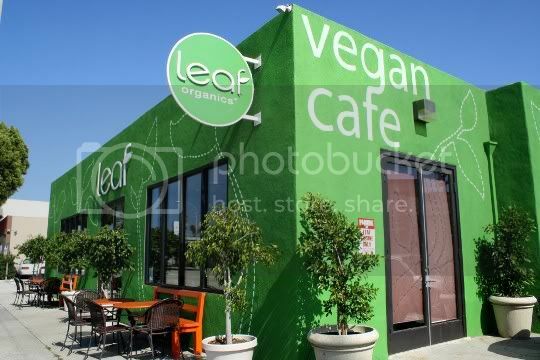 Leaf is pretty hard to miss: a huge bright-green corner building in the middle of Culver City/Mar Vista and Marina Del Rey, it just screams "healthy." The interior is beautiful, in a sort of earthy, low-maintenance way. 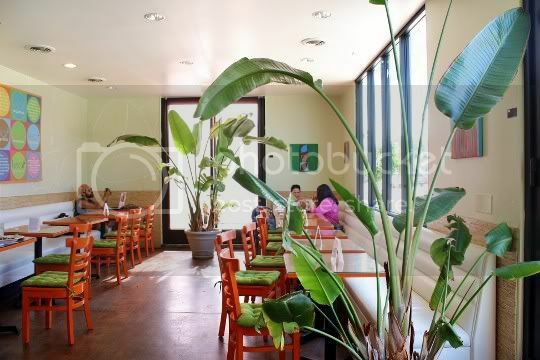 The large amount of natural light streaming through the restaurant combined with huge floor palms and orange walls gives the place a warm, tropical feel. Seating also uses the orange and white theme, and there's even a small bar available for dining. It's a bit confusing as to whether you seat yourself and wait for your order to be taken, or order directly from the counter/juice bar. During my visit, I saw both methods work. Either way, most of the staff is relatively friendly and very knowledgeable and enthusiastic about their product. Patrons seem to be a mix of regulars, curious newcomers, and all-around kooks, which makes for an interesting dining experience. This is definitely the best and easiest way to sample the entire appetizer portion of Leaf's menu...and it's so worth it. It's a nice serving size for two, or order one and eat the whole thing as an entree! A duo of corn chips and kale chips are dipped in a trio of hummus, guacamole, and cashew "cream cheese," aka the raw holy trinity of appetizers. 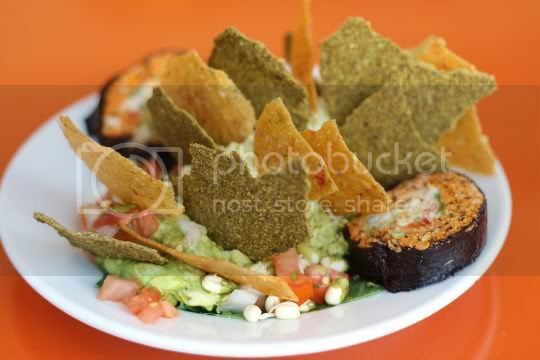 The sprouted hummus is tangy and slightly spicy, the guacamole is super fresh and creamy, and the cream cheese (get the spicy jalapeno option!) is so amazing! Seriously, it actually tastes like cream chese: tangy, spicy, creamy, and thick. The corn chips are crunchy and tomatoey, and the kale chips are earthy and a bit more fragile (although I think the corn chips tasted better, the kale chips seemed fresher). My only point deduction for this dish is the spicy California roll. I'm not sure exactly what's in it, but it tastes way too planty and, well...raw. Maybe it was fresh sprouts or some kind of super plant food, but I could only get past a couple bites. Meh. Otherwise, everything else is stellar! Raw newbies, beware! 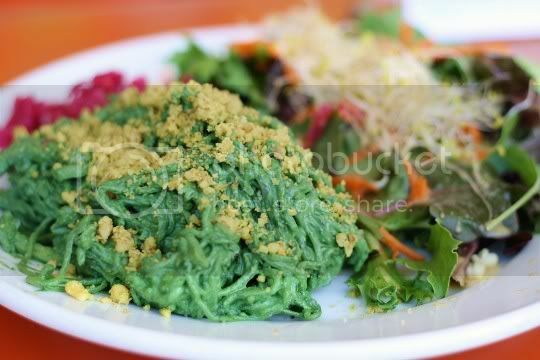 This is exactly the kind of dish you really hope is delicious, but it's way too "raw" to enjoy. I certainly was not expecting this to show up looking that way it did, and I almost stopped the waiter to tell him he served me the wrong dish. Alas, 'twas not the case. In fact, this may be one of the strangest foods I've ever eaten. Seriously, it looks and tastes as if it's from another planet (alien food!). The kelp noodles are made from pure kelp, and if you know how sea vegetables can be, then you'll know what I mean when I say, "They're alive!" Alien food lives! All joking aside, the texture of these noodles is the strangest thing: they're slightly crunchy, and it's almost as if they're alive and quivering as you attempt to chew them. For some reason, I suddenly had a vision of eating live worms which were trying to slide down my throat (sorry for the unappetizing visual). They're similar to rice noodles, but juicy and more veggie-like. Then the sauce. Ummm, green cheese sauce, eh? Yeah, I should have known this was going to be a problem. I tried to like it, I really did. It's creamy, slightly sweet, rich, and tangy. There's even delicious "cheesy" nutritional yeast sprinkles on top. But the noodles are COATED in the stuff...and let's just say, this did not agree with me AT ALL. I asked around and did some Googling, and lo and behold, the majority of human bodies aren't used to the powerful effects of spirulina (which gives the sauce its bright sea-green color). If you "overdose" on it, you can get chills, nausea, and other digestive problems. If only I had known...never again! Here's another dish that should have been good, but was just a little too raw for my liking. It's basically a lavash wrap (which was tough as hell) filled with beans, corn, zucchini, mixed greens, marinated onions, guacamole, cashew cream cheese, and pico de gallo. The cream cheese got very liquidy for some reason, I guess due to mixing with the other ingredients, and the "sour cream" drizzled on top made this only possible to eat with a fork and knife. Which would have been fine, had the wrap not been so damn difficult to cut through. In other words, this became a huge mess very quickly. The overall taste is good, although the addition of sprouts in the wrap made this too planty tasting, so it's like eating a raw burrito. I wouldn't try this again. Uh oh, now we move to a raw burger. Imagine my surprise to find this was actually delicious! I didn't taste much yam or sage in the patty: it was more of a melange of indistinguishable tangy, sweet, and salty flavors. The texture is interesting too: sort of a mashed up, thick, chewy, sticky mass of ingredients. Could dates and umeboshi plums be part of the burger? It's possible, as the stickiness and saltiness are reminiscent of these two. You have a choice of onion bread or mango bread for the bun. The mango bread, pictured here, is sweet, thin, and chewy...and for some reason reminds me of eating fruit leather. The patty and the sauce are sweet enough, so try the onion bread if you want to balance out the savory flavors a bit more. The burger also consists of tomato, lettuce, more of those damn sprouts, and a wonderful coconut curry sauce, which is light, thin, and sweet. You can definitely taste both the coconut and curry in it, and I think it would make a great dipping sauce on its own. I'd give this one another shot. Annnnd finally, we've got a winner! OMG, this is vegan comfort food at its finest. A dish that's served hot for a change, this super filling, super satisfying, super flavorful wrap is out-of-this-world delicious. 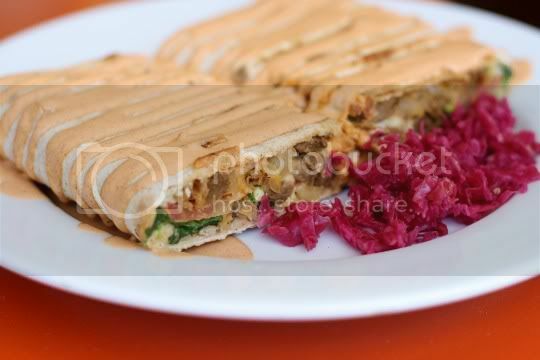 A lavash wrap (tender this time, I guess due to the heat) is filled with chewy soy beef strips, jalapeno cream cheese, loads of gooey Daiya cheddar, marinated onions, tangy sauerkraut, mixed greens, and tomatoes. It's topped with a spicy chipotle-tasting sour cream that just adds to the richness of the dish. Everything is spicy, tangy, and creamy, and the soy beef strips with all the creamy sauces and cheeses is so amazing. Even leftovers hold up well, if you have any! I'm glad that a raw restaurant is willing to break some of its rules and serve masterpieces like this, because I'd definitely go back for more! Another cooked dish, and another delicious meal. 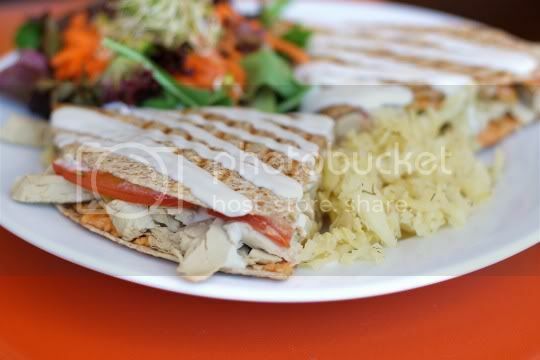 This time, it's soy chicken served in a hearty sprouted grain tortilla, along with more melty cheddar Daiya, sweet tomato chunks, tangy sauerkraut, and warm sour cream. I didn't really taste any dill, although I think there may have been some in the sauerkraut...which strangely enough totally works with the other ingredients. This dish is hearty and satisfying, and another cooked winner at a raw restaurant! 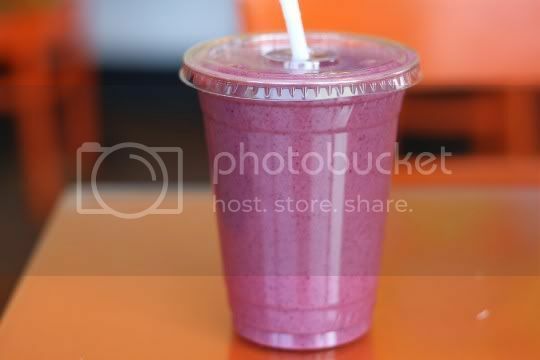 I was in the mood for something sweet, so I decided to try one of Leaf's smoothies. I chose something simple: berries, coconut "mylk," and agave nectar. Alas, the name is a bit misleading. Two issues: the texture and the temperature. It's velvety and smooth, but slightly gritty at the same time. I wouldn't be surprised if the coconut "mylk" (they have to spell it that way for a reason, right?) is mixed with some kind of ground nuts or superfood, or maybe it's the ground berry seeds giving it that strange gritty feel. Secondly, this smoothie is served pretty much at room temperature. Not exactly my idea of "refreshing." What is it with raw restaurants and room temperature drinks (even the water, no ice!)? I'm sure there's some nutritional scientific data behind it, but I prefer my beverages cold, or at least slightly chilled. And you better believe I refrigerated that thing for about two hours when I got home. Sure, I probably killed off the nutrients or something, but the flavor was suddenly 10 times better! I'd love to try the other smoothies, after they'd been chilled of course. The good thing about Leaf Organics is that they've got something for everyone: raw, cooked, or somewhere in between. Although some items seem hit or miss, the food is pretty good overall and the place is super chill. Oh, and it's also right up the street from Rainbow Acres, an AMAZING natural foods store with probably almost every vegan grocery item you can think of! Make a day of it! I wrote recently about getting a room-temp smoothie in a raw restaurant and really being disappointed by it http://almostveganchef.com/2011/07/15/a-disappointing-first-dinner-at-raw-aura/ Room-temp liquids ARE easier to digest, but I could care less about digestion when I'm trying to get my smoothie on! I haven't been to Leaf in a long time but I'd be willing to go back, what I had was sooo good! I'm in Long Beach now so I don't frequent the westside much except for work but one lazy Saturday, I'll have to hit it up again.